Javelin is a new product family in the blackberry Bold. Shape does not vary much with the Bold, is still a standard mobile phone and Blackberry still provide qwerty keyboard as one of the characteristics. Bold considered revolutionary design approach for the Apple iPhone and HSDPA network that allows access to data more quickly when the BIS can not be relied upon. Two and a furor that must be removed in 8900. This product has a shape similar to the Bold (Blackberry 9000). The only posture the reduction to several percent, so it tends to be smaller and Mobile Phone Review like the Nokia E71. 8900 be more comfortable, but it is better than a Bold? Materials quality has decreased. At least for the major bones and back cover. The qwerty keyboard and the way the ball does not work there is a problem. Both were able accelerate well. And is the best means of input for a mobile phone business. Mobile phone operating system is the same with the Bold, the Blackberry OS version 4.6.1. This effect on the view menu and the nature of the software inside. Not different from the Bold 9000. They also brought the quality of the screen. Still, such as Bold, Javelin have a screen that uses high-resolution, VGA half or equal to 480 x 360 pixels 2.4 inch in diagonal. While the depth of color that brought TFT screen is a 16 bit (65,536 color). The performance is supported by a mobile processor with 512 MHz clock speed. Bold is not as good as the 623 MHz has been reached, but still good. Especially with the support of flash memory of 256 MB, then the acceleration system will not feel much different with the Bold. 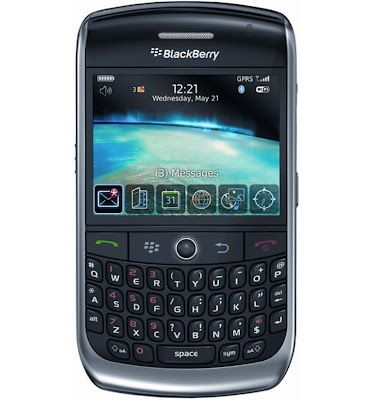 For additional storage facilities, Blackberry Curve 8900 Javelin using Micro SD memory card type card. Blackberry Internet Service is a service unique to the last can only be accessed by any mobile phone Blackberry. Of course, this is a superior first Javelin factors. With this service also, we can receive email automatically without the need to access the browser first. This is called the Push Mail feature. A Blackberry device, including 8900 have been equipped with several network applications. If in 8900 there is no application program, you can download and install directly on the phone. Services available include Facebook for Blackberry, Yahoo Messenger, Blackberry Messenger, Gmail, Google Maps, and more. No navigation features in this phone, but do not worry the phone for a GPS receiver in the system and should already have Blackberry Maps feature therein. As a complement, you can purchase additional navigation features. It is not as much as for the Windows Mobile device, but such is feasible Garmin Mobile. Blackberry Maps has a nature similar to the Google Map. Where is the map data will be through a process stream. Good, the attempt to use this streaming Internet channels Blackberry, so do not spend too much credit. Javelin recorded only winning On the one hand, and that is the camera. 3.2 mega pixel camera that not only brought the larger picture in the resolution but also slightly increased the quality. Besides can be used for photographs, the camera Javelin can also be used to record video. Resolution is quite convincing because it is almost in line with the screen resolution. However, for the purpose of MMS, of course, the resolution must be appropriate. Recommended Media Javelin Walkman reminds us in the media owned by Sony Ericsson. A feature in which we can find several different functions. Here we can use the video player, ring tones, picture browser, and audio recorder. Meanwhile, as the audio output in the mobile phone, using the Javelin speakers placed close to the earpiece. There is WIFI, Bluetooth and micro USB data cable in the phone. So, if you want to connect with high-speed Internet, we can use the path WIFI. Unfortunately we have to find a location with a hotspot first. Bluetooth is already available in their own version of the most advanced. Supports almost all profiles, including A2DP. Javelin brings Lithium ion battery capacity of 1400 mAh. Without 3G should be able survive longer compared with the Bold property. Lithium Polymer type of battery used Bold has several advantages on the effectiveness of dab resistance. But are less when the battery is completely exhausted. Polymer type of battery sometimes can not be charged in the situation like this. Once in the charging, the battery Javelin survive in a period of 2 to 2.5 hours with the standard. Blackberry Curve 8900 Javelin is an alternative mobile phone Blackberry Bold when it is still too expensive. With a nice design and all of celebrities like this gadget. But the price difference is not too far behind because of some doubt must be the 3G. Whether the product is so deliberately made for those who do not need a 3G network? Blackberry service can still be running smoothly via the GPRS channel. Whatever the reason, it is not less Javelin premium rather Bold. Unfortunately the Blackberry can not change the culture as soon as the "mobile phone". And even provide a sense of security, the system PIN of the Blackberry product simply making money, both for Blackberry users and customer service operator-operator that has this service.